Several military installations and civil settlement structures are known mainly on the right bank of the Danube under several districts of modern Budapest. The south and the west gate of the legionary fortress, the bath house and the large amphitheatre are partly preserved and still visible. 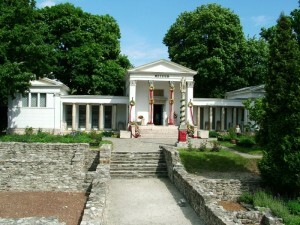 The core element of the Roman site of Budapest-Aquincum is the archaeological park which includes a large open air space and a new museum building. It offers regular exhibitions, education programs and a museum store with extensive information material.